Scott Brash (GBR) goes into today’s Longines Global Champions Tour Grand Prix of Madrid riding his star horse Ursula with a mission to extend his series ranking lead. The British champion has already secured a golden ticket to the Longines Global Champions Super Grand Prix at the GC Play Offs in Prague this December after a stunning win on Ursula at the opening leg in Mexico City. 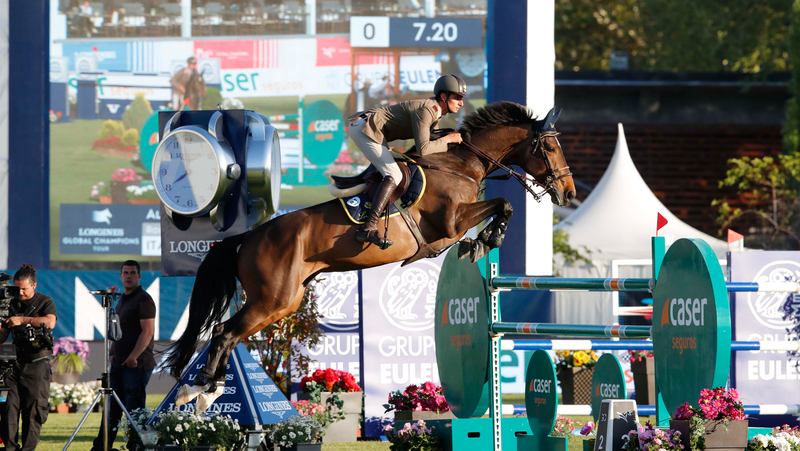 But he faces stiff competition from his nearest rivals on the LGCT overall leaderboard - Edwina Tops-Alexander (AUS), Daniel Deusser (GER) and Gregory Wathelet (BEL) who are all in the Spanish capital city for the fourth showdown of the 2018 circuit. The immaculate, sweeping grass arena at Club de Campo Villa de Madrid has a slight gradient which makes course calculations even more interesting for the 1.60m LGCT Grand Prix. The competition is even more high stakes this season with all the top riders in hot pursuit of a place at the new GC Play Offs at Prague’s O2 Arena. Some of the most famous equine athletes in show jumping are in Madrid for the LGCT and GCL and 2016 Madrid LGCT Grand Prix winner Marcus Ehning (GER) will bring back Pret A Tout. The lightning fast Hermes Ryan will take to the expansive grass arena with Simon Delestre (FRA) bringing his lead horse to the first European event of the season. Ben Maher (GBR) brings back his skilled duo who helped propel him up the overall rankings, Explosion W and Winning Good. The incredibly passionate Spanish crowd, 26,000 attended the event last year, will be cheering on home heroes including Sergio Alvarez Moya (ESP) and compatriot Eduardo Alvarez Aznar (ESP). The beautiful show ground surrounded by the snow-covered mountains in the distance and the ancient castles and modern skyscrapers of Madrid is another impressive stop on the LGCT circuit. Some of the young stars on the circuit will be in action including Anna Kellnerova (CZE) and Emily Moffitt (GBR) both of whom have achieved strong wins in the GCL so far this season. So far this weekend Julien Epaillard and Instit de Jucasco impressed with a convincing win in the opening 5* competition almost two seconds ahead of Maikel van der Vleuten and Laura Kraut. Darragh Kenny showed strong form winning the individual session of GCL Round 1. Tune in at 15:15 today to watch all the action live via GC TV, with the LGCT Grand Prix of Madrid kicking off at 18:45 local time.